Keeping the aviation industry moving safely is at our core. It’s what we do every day here at Airservices, and our current air traffic management system TAAATS is the backbone technology that supports us to be one of the world’s safest Air Navigation Service Providers (ANSPs). 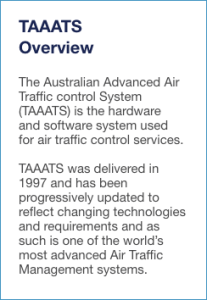 We’re proud of TAAATS, the technology was ground-breaking when we introduced it back in the 1990’s and it created significant change for our air traffic operations. But TAAATS is reaching its end-of-life, its technology is aging and unable to match the capability that new air traffic management solutions can offer us, so we have made the decision to replace it. Australia’s military air traffic control system (ADATS) is also reaching its end-of-life so together with the Department of Defence we’re working on an exciting and innovative new solution. We’re creating Australia’s first harmonised civil and military air traffic management system, or CMATS for short. What is the OneSKY Australia Program? The OneSKY Australia program is a team of experts from Airservices and Defence working together to deliver Australia’s new CMATS. OneSKY aims to provide a CMATS that is safe and secure, efficient and harmonised, reliable and cost effective and importantly provides value to our customers. Put simply it will enable us to jointly: Deliver safe air traffic services; deliver more efficient air traffic services; manage future air traffic growth; and support national security. This is a significant program focussed on aligning the needs of civil and military aviation. Our joint approach is enabling us to introduce new cutting-edge air traffic management technology to ensure we improve safety and efficiency for civil and military air traffic, while catering for the significant forecast growth in the aviation sector. It’s also enabling us to be innovative about our future air navigation services, so we can create value for the Australian aviation industry.